One of the most popular designs of the cuckoo clock today is the chalet design. A "chalet" is a house in the Alpine region of Europe. The popular chalet design of cuckoo clocks is actually of Swiss origin at the end of the 19th century. 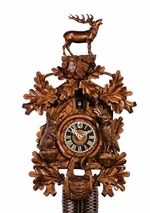 Black Forest clock-makers took the design, and many Black Forest clocks are made in this style too. Prior to this, there were many other types of cuckoo clock designs that depicted scenes of nature, life, and work. Today, new designs are created all the time. My Cuckoo Clocks offer large selection of imported German chalet cuckoo clocks. We know our 1 or 8 day chalet cuckoo clocks would look great in your home.